I want to write some pun about mops, buckets and cleaning, but can’t think of a good one. The expac is finally here. I’ve arrived back from my USA trip, with almost a week still of holidays to go. 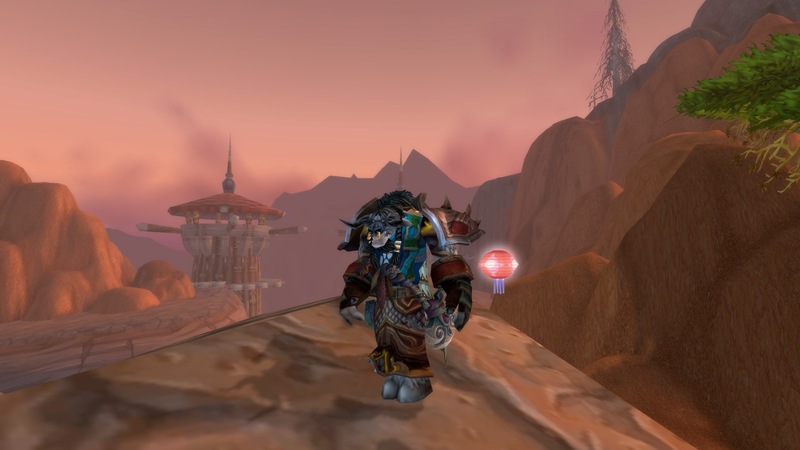 I’ve updated my add-ons, updated my Mac and downloaded the last patches for WoW. I have my internet back this very afternoon as well. Sounds perfect. I’m good to go for some solid MoP exploration. Except my copy hasn’t turned up yet. Ah hum… it’ll probably be more than a week before it does arrive. So what to do…. Well one of things I wanted to try was the Scenario, Theramore’s Fall. But Mab doesn’t seem to qualify. I did think it was iLevel, but if it’s 353 as I read somewhere, then Mab has 370 so should be fine. Anyone the LFG tool won’t let him queue. EDIT: Seems they turned the run up to lvl 90 with the MoP official release. Can’t level Mab or Dasal, need the expac. Can’t start a Panda, need the expac. Could keep working on Mabango… that’s not a bad idea. Until Tacky suggested Pet Battles. Wandered over to the trainer (who trains*) and got started. Also bumped into Cymre and must get started on many of her posts that I purposefully ignored, so as not to spoil the expac. But at least I can read about pet battles. Was a bit lost at first until the first green paw showed up on my minimap. I was well into it soon after. After about 15 mins, I have raised a few pet levels, won a few, caught a few new pets. Been interesting. I can see you needing to really raise a whole range of pets with their strengths and weaknesses. 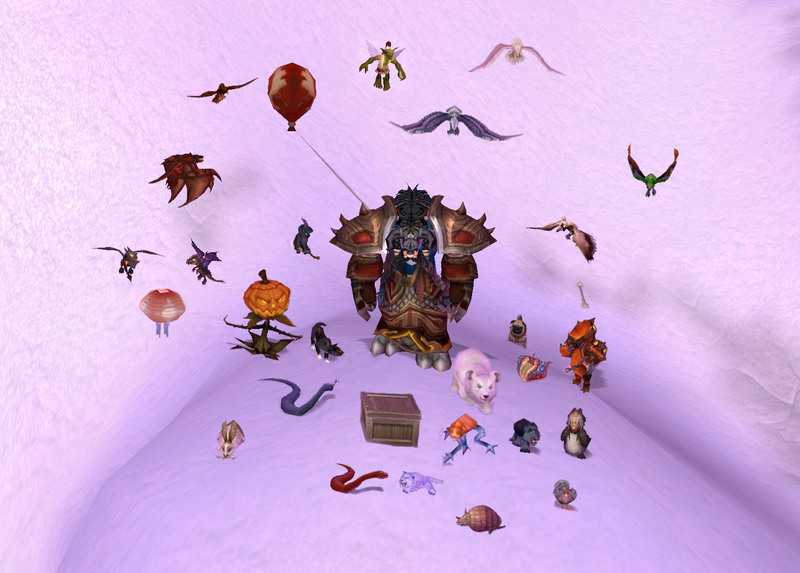 Then swapping your three slots depending upon the pets in your current zone. For example, near water you are likely to meet aquatic pets, so have 3 slots of flyers probably won’t help, but those same three will devastate cats. So I guess I will become a pet expert over the coming days. Mab has a new pet (left side) Rabid Nut something 5000. 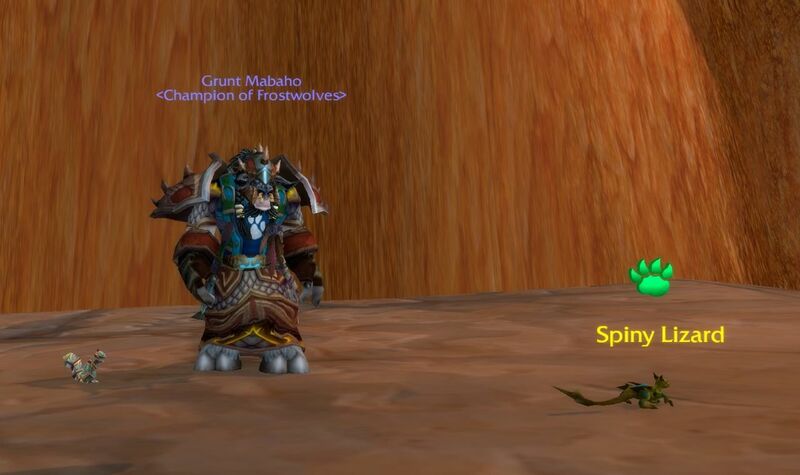 Also shows the green paws to look for that designate combat pets. *a reference to the recent Pink Panther movie, Yuri the Trainer who Trains becomes a suspect in the investigation. With some grinding and a few dailies to finish up, I managed to get enough Tokens in order to get Peddlefeet. Then, inspired by my work on my banner, I made this. I won’t be doing that again. Cleaning up around each pet was extremely monotonous. At least I have it saved and can add other pets as I earn them, rather than doing 28 all at once. I’m well aware its not the greatest collection. My favourites are the Creepy Crate, the Wolpentigger (my first pet), the Sinister Squashling and the Corehound pup. I have actually had a Hyacinth Macaw drop, but you’ll have to check out Navimie’s collection to see it. Now that the dresses have been completed, I decided I might as well get the pet. So I’ve been grinding away in my normal spot. 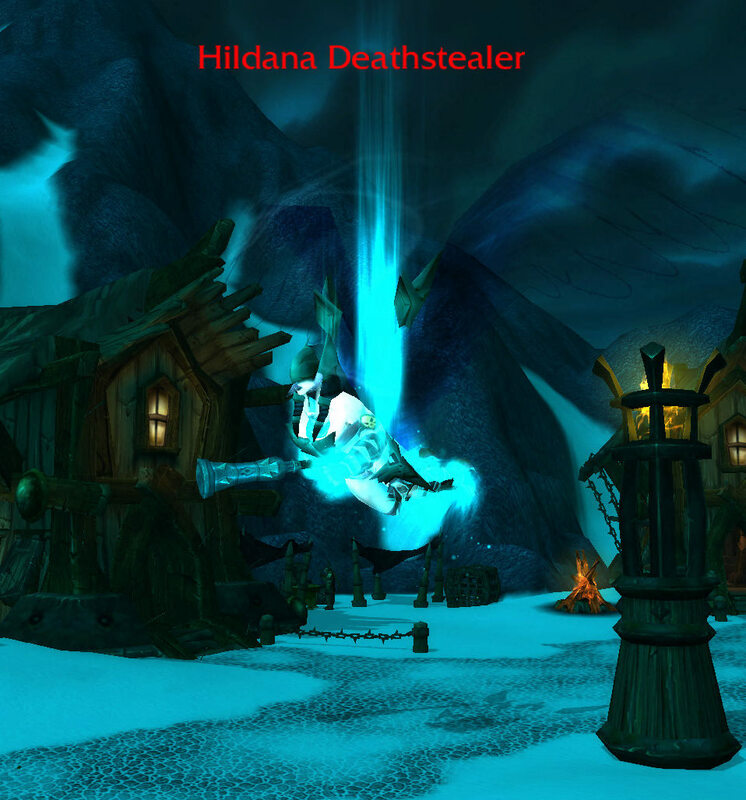 I use a place over in Icecrown at the Valkjyr village next to Icecrown itself. It has a string of mobs that I can circle around, killing quickly. Mab isn’t a great AOE killer so its easier this way. In a cavern at the back of the village are these ladies who seem to spend their time bashing the enslaved orcs. And they are only in the cavern. This morning I was merrily smashing my way through a back corner of the village when I came across one. Just as it was about to drop I’ve realised. OMG its a rare I should get a screenie. I got the Northern Exposure achieve. But my screenie looks like this. She could look like this (Navimie collection). Now as far as I know, this is my second rare. I also killed something in Archidoun many years ago. My achieve Bloody Rare notes it as Crippler. I also found a treasure chest. I wonder how many times I’d run past that this morning! With this luck I might head over to Stranglethorn see if I can get a second Hyacinth Macaw. Ok, Mab done the work and the girls get their new dresses. Here’s Dasal Modelling her two for you. Dasal in the Elegant Dress (the Pink Princess one) with a Red Linen Shirt. Miss 4 has been placated again, but she will have to wait until Noble Garden festival before Pink Princess can properly return. While trying to figure out the best way to get these dresses for Miss 4, I sent Dasal on a flightpath from Warsong Hold up to the Ebon Blade site. I headed AFK to sort some RL things out and eventually came back. 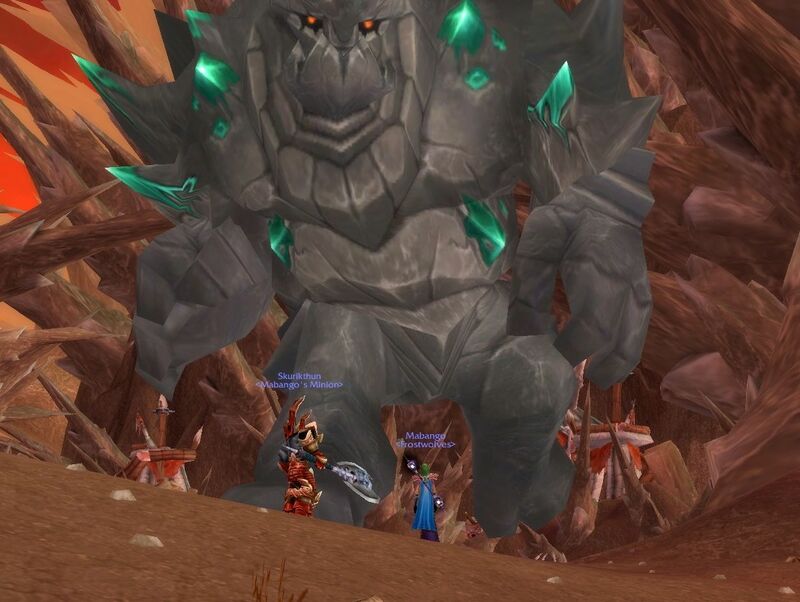 A bit of background is that apart from about a level or so of questing at 70 and 80 in the starting areas for each (Borean Tundra and Mt Hyjal respectively) Dasal has spent her entire time levelling inside 5mans using LFG. It does mean that she has very blank map and very little rep with anyone. So I return to my computer to find her half dead as the DKs at Ebon Hold have been smashing her since she landed. Only her high level has saved me from a ghost run. I have picked up a lovely black number for Mabango though. Author MabahoPosted on February 12, 2012 February 12, 2012 Categories WoWTags alts, World Events, WoWLeave a comment on Where’s my Rep! Some time ago (maybe a couple of years) whilst Mabango was still just a bank toon, I picked up a pink dress for her. Since then Miss 4 (back when she was Miss 2) has known her as Pink Princess. Several months back, Miss 4 went through phase of going through my alts bags (so glad she never learnt about the bank!) and destroyed everything she could. It was a while before I noticed as she did it to all except Dasal and Mabaho. Turns out that one of the things destroyed was this pink dress. Then, the other day she wanted Mabango to wear it again. Not in her bags, so where did it come from? I knew it came from one of the World Events, and the Valentine’s one has just started, so I researched dresses and found I need to farm the Lucky Charms, to create Bracelets in order to buy stuff. This included a Dress Box. Sounds like the item. I started, slowly, getting together the charms, thinking the whole time that this seems much more difficult than Mabango would have done the first time. I didn’t remember Mabango fighting anyone (Mabango was probably about level 2 until about 4 months ago) ever. Turns out I was chasing the wrong dress. The pink dress was from Noble Garden. I’m halfway there with tokens so I’ll keep going and then Mabango can try something like this on. Might get one for Dasal too? Not sure how she will go trying to earn the charms though. 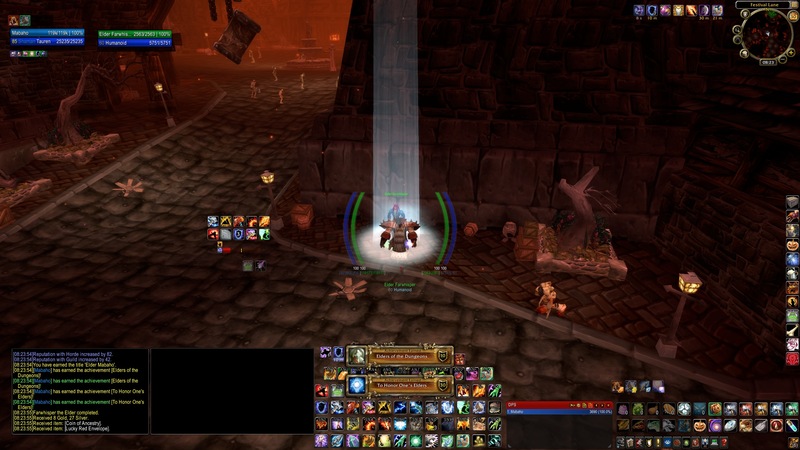 Dasal has almost never killed a single mob in 85 levels. I wonder if the dresses or boxes are BoE. Maybe another toon can farm the stuff for them. Update – Found an Elegant Dress in Dasal’s bank, so they’re not all gone. Farming for tokens is far easier on Mabaho than Mabango and Dasal. So Mab will do the heavy work and give the girls their dresses. I finished off the Elders achievements this morning with a last run through the Eastern Kingdoms dungeons. As always Blackrock is a confusing collection of entrances to different runs. I suppose if I had been 60 prior to BC (I was about 45) then the place would be more familiar. But I ended up as my final one in Strat. Considering I farmed this place for a while trying to get the Baron’s Mount I suppose it was only fitting. The annoying one was Mara though. I don’t have the staff that lets you teleport into the middle of it. I can’t even seem to get the quest from the quest giver. I can’t have completed it, as the notes say the staff can be recollected from the boss if you lose it, but that didn’t happen either. I only ever ran Mara a couple of times on Mabaho (but Dasal has spent many hours in there) so I doubt I had done it. I wonder if the quest has been removed (like all the keys are gone now). But not having the staff means a lengthy wander through the vast run to get to the Elder. Anyway, here’s a screenshot. You also get to see my UI. Now I have Elder, but I expect I will still leave my favourite Grunt title up. I wrote the title as I was planning to talk a bit on my decision to join in a actually try and get most of a world event. 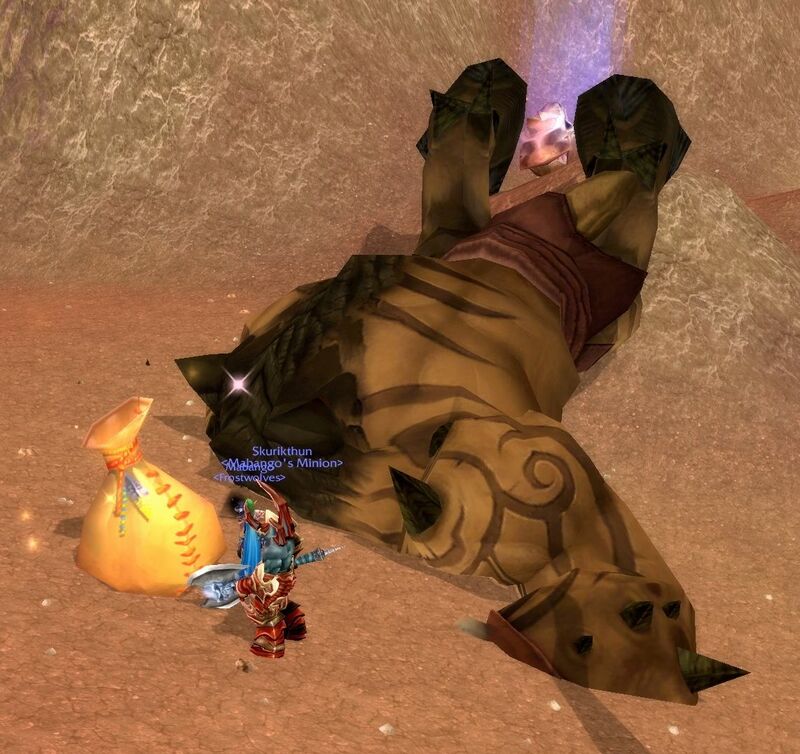 I have almost completed Brewfest (I actually picked up a Wolpentiger when you had to complete the quest for it) and have the Noble title, but yesterday I got stuck into the current Lunar Festival one, mostly to grab the lantern (maybe deep down I am a pet collector???). So “Respect” for paying respects to the elders that we visit. I was a bit frustrated to see that there was one in Wintergrasp that you can’t get to unless your faction owns the zone. I did pick it up today so it wasn’t too hard, but I was thinking back to WotLK when on many servers one side or the other hardly wins the zone. Of course these days, with no one playing it, one person can go around and knock over the zone unopposed. The title inspired me to have a small whinge about LFD. I would probably include LFR but I’ve never used it as none of my toons are high enough iLevel. I will readily admit that as a solo casual player LFD has been a huge change in my ability to get gear, get 5mans done etc etc, and it is a lot faster than sitting about in /5 LFG channel spamming Enh Shaman LFG for Mara etc for 30 mins. And I know a lot of the PvPers have since enjoyed better queue time from the cross realm stuff. But I do miss the bumping into the same people as you level up, and getting to know the different guilds and people on your own server. I know others have spoken about it much similar vein. I don’t think we should go back though. Maybe a fix could be to sort groups so that each was primarily made up of your own server and only filled in the blanks. Okay, enough deep thought. Mab has the lantern now. I still need to do Cata and Dungeons for the title. Might get that done this year….we’ll see.